The easiest way to access the Insert Slides dialog for managing screen recordings is to click the drop-down arrow at the bottom of the Record Screen button, which is on the Home tab if you're in Story View and on the Insert tab in both Story View and Normal View. Then select the recording you want to export. Export movie: To export a copy of the screencast as an MP4 movie, right-click the preview area of the window, and select Export movie. Save frame: To save a frame from the screencast an a PNG image, use the play button or the seekbar to locate the frame you want to save. Then right-click the preview area of the window, and select Save frame. When the Insert Slides dialog appears, select the Screen Recordings tab on the left. 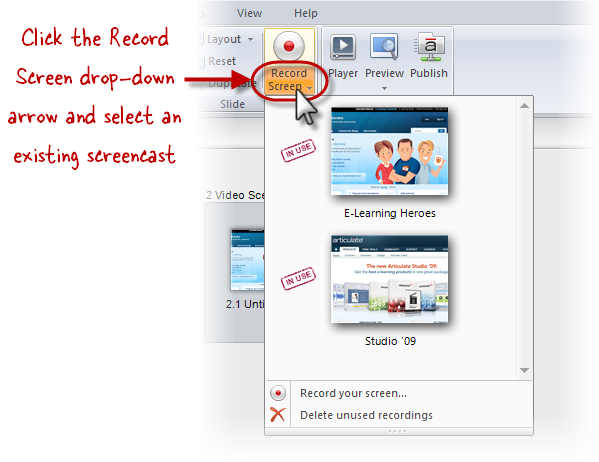 Then use the Insert From drop-down list at the top of the window to select an existing screen recording. The Action Fine Tuning editor allows you to change the starting and ending frames for each slide in step-by-step screen recordings. 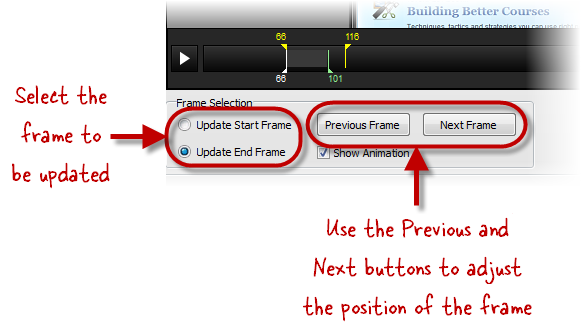 (To learn more about the Action Fine Tuning editor, check out this tutorial.) However, you can also use the Action Fine Tuning editor to export screen recordings, and there are some additional features when using this method that are not available in the Insert Slides dialog (described above). Namely, when exporting a movie, you can choose either the entire recording or a specific clip. And when saving an individual frame as an image, you can either choose to save it at the size as it appears in the project or at the size as it was originally recorded (if those sizes happen to be different). Note that the Action Fine Tuning editor is only available for screen recordings that have been inserted into your story as step-by-step slides. This method does not apply to screen recordings that have been inserted into your story as videos on a single slide. To learn about the different ways a screen recording can be inserted into a story, take a look at this tutorial. To export screen recordings, navigate to any slide in your story that is part of a step-by-step screen recording, right-click the slide, and select Action Fine Tuning. Export movie: To export a copy of the entire screencast as an MP4 movie, right-click the preview area of the window, and select Export movie. Export clip: To export only a portion of the screencast as an MP4 movie, right-click the preview area of the window, and select Export clip. 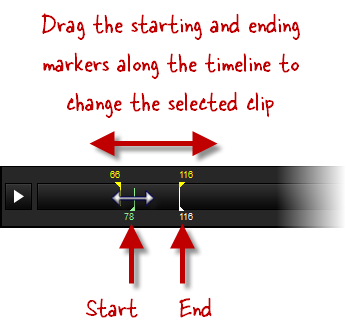 If you need to modify the starting and ending frames before you export the clip, simply drag the starting and ending markers along the timeline until you have selected the clip you want. Or, for even greater precision, select either the Update Start Frame radio button or the Update End Frame radio button in the lower left corner, and then click the Previous Frame or Next Frame button to move the starting or ending point along the timeline one frame at a time. Save frame (project size): To save a frame from the screencast an a PNG image at the same size as it appears in your story, use the play / pause button to locate the frame you want to save. Then right-click the preview area of the window, and select Save frame (project size). Save frame (original size): If your screencast was originally recorded at a different size from the way it appears in your story, you can also save a frame as a PNG image at the original size. Use the play / pause button to locate the frame you want to save. Then right-click the preview area of the window, and select Save frame (original size).